We will be building a contact list view in this example. The first step we need to do is create a custom array adapter. In this example, we will build a list of our favorite cartoon characters. We will keep the model class simple. It will contain the name of the character, a thumbnail picture and a bit of description about the character. Below XML is the layout of list view. Below XML is the layout of list item view. Our adapter will extend the ArrayAdapter class and override its getView() method in order to provide a custom list View. We will inflate our list item view layout and populate the content based on the row position and the model. 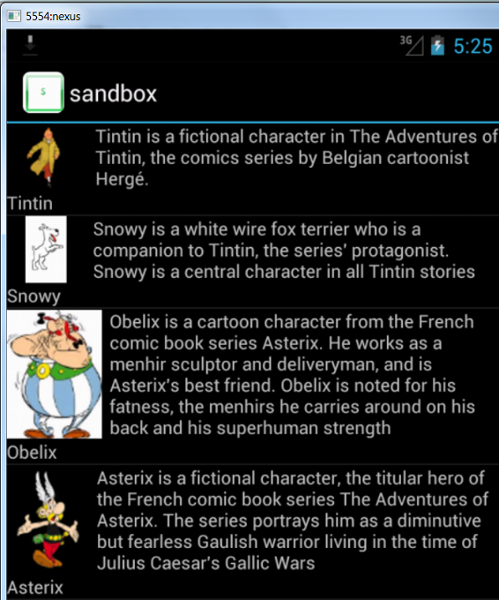 We will find each widget using the findViewById() method, cast it to specific the widget type and then set its content. Our list activity class CartoonListActivity will extend ListActivity. In its onCreate(), we call setContentView to set the layout to the list view. We then build our model, the cutsom adapter based on it and call setListAdapter to set the custom adapter. Here is the final look out the custom list view.